A few days ago, when Obama & Clinton supporters first turned their attention in earnest to the primary in Puerto Rico ("PR"), several Obama supporters gave short shrift to this primary, even going so far as to suggest that PR's primary results be excluded from calculation of the popular vote leader. Although they correctly point out that PR does not have a role in U.S. presidential elections, they overlook the DNC's decision, back in the 1970s, to give PR a role in selecting the Democrat's nominee for president as a means of courting Latino votes on the mainland. (Michael Janeway, PR's Moment in the Sun, NEW YORK TIMES, May 22, 2008). But in recent years, Democrats have not been uniformly successful in courting that vote, while the margins of victory in presidential elections have become smaller and the Latino population here has continued to grow. With all this in mind, it is instructive to consider the role Latinos have played in this Democratic primary season and how it compares to their role in the 2004 Presidential and 2006 mid-term elections. The Washington Post reports on Hillary Clinton and Barack Obama's differing strategies for winning delegates on Tsunami Tuesday, February 5. Hillary is targeting four big primary states, California, New York, New Jersey and Arkansas, while Obama is gearing up for the six caucusing states -- Kansas, Colorado, Minnesota, North Dakota, Alaska and Idaho. In New Jersey, one of his targets is independent voters. In Georgia and Alabama, he is seeking to replicate his South Carolina strategy by targeting African Americans. Obama has a large, stately brick home on Chicago's South Side with an estimated value of $1.9 million. 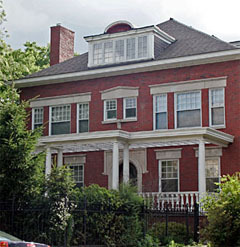 The Chicago Tribune describes it as a "96-year-old Georgian revival home that has four fireplaces, glass-door bookcases fashioned from Honduran mahogany, and a 1,000-bottle wine cellar." 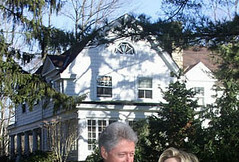 Compared to the other candidates, Obama seems a pauper with assets of between $456,012 and $1.1 million. Now that the Democratic debate in South Carolina is over and the next real action isn't until Tsunami Tuesday, February 5, it's a good time to ponder what the real issue will be in November. I sincerely doubt it will be race or gender, no matter who gets the Democratic nomination. It will be the economy -- or, if Bush decides to help the Republican candidate by ratcheting up the fear of terror and elevating the threat level, national security. So, here's a poll below the fold. What do you think the major issue in November will be? Update: Obama has sent out a new mailer in South Carolina. Take a look (pdf.) Is he vying with Huckabee for the religious vote? He uses the phrases "Called to Christ," "Committed Christian" and says he will be guided by prayer in office. There's even a photo of him with a large cross behind him. Hillary Clinton spoke in Harlem at the Abyssinian Baptist Church. She has been endorsed by its minister, the Rev. Calvin Butts. Bill Clinton spoke at Harlem's Convent Avenue Baptist Church. Barack Obama spoke at Ebeneezer Baptist Church, in Atlanta. It's the church where Martin Luther King, Jr. presented his sermons from 1960 to 1968. Bill Clinton will speak there tomorrow. Chelsea Clinton and Michelle Obama attended the same church service in South Carolina. Neither spoke during the service although both were introduced and applauded. Darrell Jackson, the church pastor who delivered the sermon, is a a state senator and paid Hillary campaign advisor.